The experience of using the mobile web, especially when that device is not connected to Wi-Fi, is slow. I’m guessing that you have experienced searching for a topic on Google, clicking on a link and then been extremely frustrated by the loading time of that page and it has had a negative affect on your experience and feelings with that website’s brand or you have simply clicked back to the Google search results. A fascinating introduction to Accelerated Mobile Pages from Google News Lab. This mobile screenshot shows how Accelerated Mobile Pages are indicated just below the meta description text. If you use WordPress, there is an AMP Project plugin from Automattic that you can install which will automatically create AMP versions of your blog’s posts. Accelerated Mobile Pages have their own URL and the URL usually will end with “-amp”. For much more in-depth information on how the AMP Project works, take a look at the AMP Project website. Accelerated Mobile Pages are now appearing within Google’s mobile search results. The speed of a web page is already a ranking factor so it would be sensible to think that AMP pages will be favoured on mobile devices. If you are reading this blog post then it is likely that you work on a website in some way as part of your work. Even if you aren’t a technical person it is still important to be aware of this so that the website(s) you work on have Accelerated Mobile Pages as this is very likely to become more important from a Google positioning stand point. Probably even more importantly, it is critical for your website’s visitors that they have the best experience possible and a fast page is a key feature of this. More information on Accelerated Mobile Pages from Google Chrome. I think that the Accelerated Mobile Pages (AMP) Project is a great idea as it improves the experience that people have with the mobile web which, currently, is below par and is in major need of improvement. It seems logical that Google will give Accelerated Mobile Pages a higher ranking on mobile search results which will also increase the priority that this is given within organisations. It will be interesting to see how people incorporate these pages into their websites and whether they go all-out with regards to stripping back features or if they try to sneak certain features, such as pop-up ads, into these pages somehow. 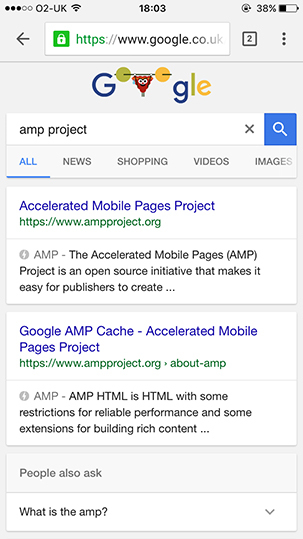 What are your thoughts on the Accelerated Mobile Pages (AMP) Project?